It’s been exhilarating working with several $100 million — and larger — publishers over the last couple of months. These companies spend millions of dollars on member acquisition. They track their numbers and know what’s working — and what’s not — within their marketing and sales funnels. Some have weekly training seminars for copywriters. They get together, analyze promotions that are working, talk about what’s effective, and consider how they can use these ideas to improve their own promotions. They make a tremendous investment in new-client acquisition. Many of the top copywriters are paid more than $1 million a year to create winning subscriber-acquisition promotions. And these great promotions are art; they are interesting to consume, and I can feel myself get excited when I look at them. 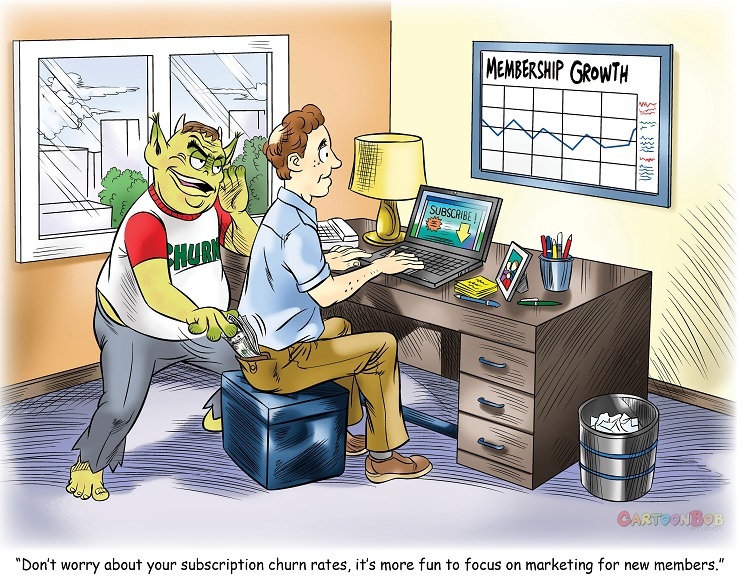 I agree that customer acquisition is important, but what about the art of keeping subscribers? It’s one thing to make a sale. But the bigger challenge is getting your customer past “The Credit Card Moment of Truth,” where they to pay for the subscription instead of refunding the sale. And it’s an even bigger challenge to get a renewal. What about the people who create the products that help members to stick and renew? Too often, member retention is an afterthought. Companies that vet sales copy through copy chiefs and editors will send out editorial products without a second review. Every email your company sends either builds a relationship with your subscriber or it erodes it. How much training are you giving the people who are creating these vital communication materials? Over the last few months, I’ve led several training seminars for fulfillment teams at subscription companies around the country. This month, I’m traveling to Germany for a week of training at VNR a muti-publication publisher with a team of 495 people. Luckily for you, I’ve been doing a lot of retention training over just the last few months. If you’d like me to help you empower your team to stop churn, send me an email to RS@RobertSkrob.com. In the meantime, here’s a quick guide so you can lead a discussion on retention with your team. The Sale After the Sale. For me, it’s always been easier to buy a diet program than to start a new diet. There are all kinds of mental hang-ups that keep me from moving forward. What beliefs and activities prevent your subscriber from engaging in your program and generating results? How are you continuing to sell your new member — to get her to consume what you are delivering? All About the Transformation. Weight-loss advertising illustrates the benefits of their products with before-and-after photos from someone who implemented their fitness program. How are you showing your new subscribers the before-and-after results to illustrate the benefits of your subscription program? The Retention Point™. Within every subscription membership, there’s a point in their membership when they become a true believer. They become a member of your tribe; they love you and want to talk about you to their friends. Consider the guy who converts from PC to Mac. For a while, it’s hard to learn how to perform simple tasks, like checking email. But at some point, he becomes an Apple believer. He becomes one more irritating Apple user who believes he’s better than everyone else. What does it take to get your customers through that learning stage, so they are a member of your vibrant tribe? What do your current tribal members believe about themselves and the world? How can you use your new-member welcome campaign to speed up this conversion? Great content alone won’t stop your members from quitting. No matter how good your product is, you still have to cut through the clutter in your member’s life to get him or her to use it. Discuss these concepts, empower your team, and stop that churn.